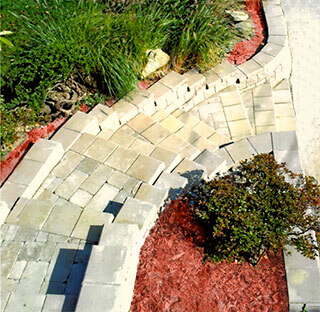 At Showman Hardscapes, we are no strangers to working with hilly, broken, and eroded terrain. 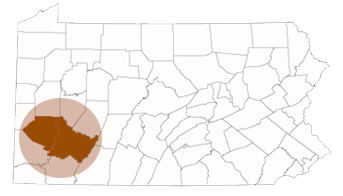 After 17 years of working in the Greensburg and Westmoreland County areas, we’ve faced the toughest challenges. We’re confident in our ability to bring a touch of elegance to your property through the expert application of retaining walls, Unilock pavers, and landscape lighting. To learn more, contact Showman Hardscapes today. If, like many homeowners, its time to graduate from the concrete sidewalk to the charm of a paver walkway, Showman Hardscapes is an exceptional choice for both design and execution. Today, the wide variety of colors, textures, and accents available with Unilock pavers means that your new walkway can coordinate with or complement your home like never before. An attractive walkway creates curb appeal, increasing the value of your property. Combined with vertical elements like a pergola, your new walkway, steps, and landings can become an outdoor extension of your home’s elegance. To get started, call 724-523-8422, or visit our Contact page today! Here in Westmoreland and Allegheny Counties, the hilly landscape makes it likely that you will need a combination of steps and walkways. Thanks to his wide experience in landscape architecture, Jeff Showman can re-sculpt your front areas to eliminate or conceal any inconveniences or less attractive elements. 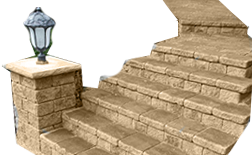 When it comes to hardscape steps and walkways, there are no “Downs” Only “Ups” when working with Jeff Showman. To inquire about your next project, call 724-523-8422, or complete the easy form on our Contact page.